Having all patios or outdoors like a barren land? 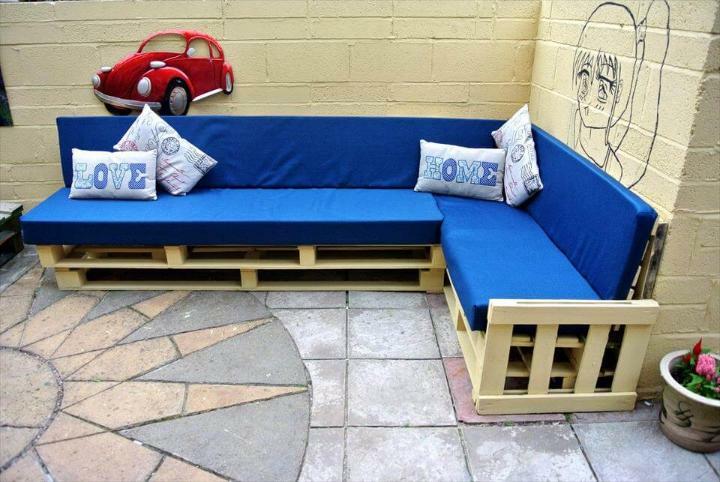 Let the conversations and fun start there just by a wise landscaping of them with amazing and low-cost DIY projects! 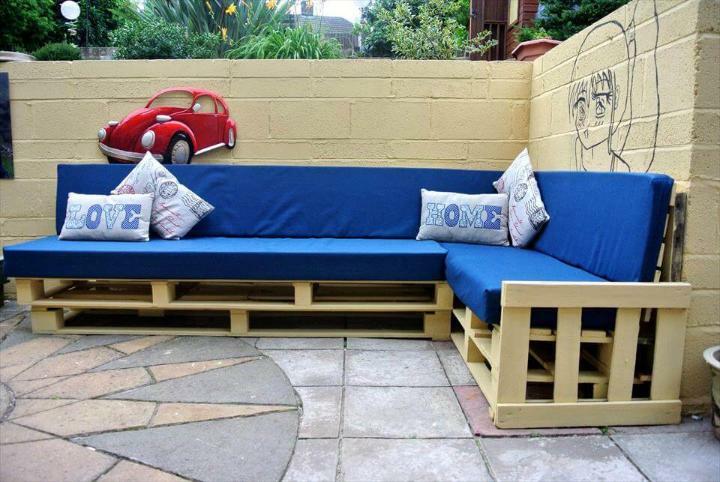 Pallets may the best ever DIY material to use for fascinating and well developed outdoors! 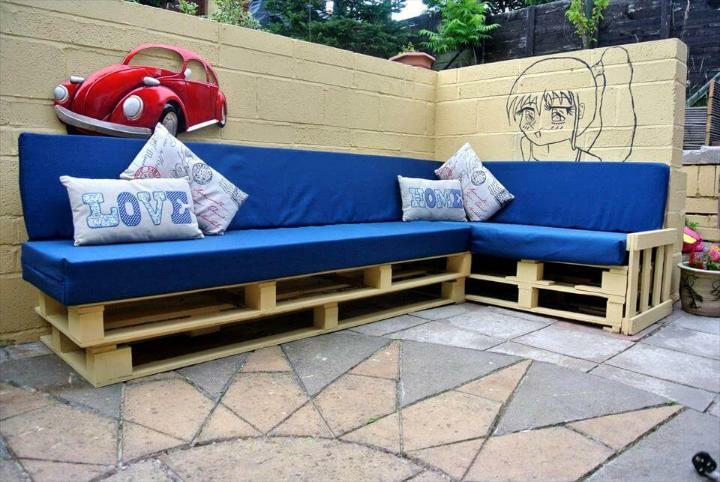 To turn any boring outdoor to a sophisticated sitting environment, this DIY pallet sectional sofa or couch will be all awesome choice! It is all having a sturdy wooden composition done with separated straight pallet lengths! The backrest are just the straight flat wooden boards made of single pallet planks and have been adjusted precisely there to support your back in a comfortable way! Blue foam cushion has been added to entire sectional sofa frame just to get it all soft and warm to sit on and also for an eyeful visual of the sofa! This customs sectional couch would be all friendly for part time sitting and would also be phenomenal for outdoor beverage parties and feasting! 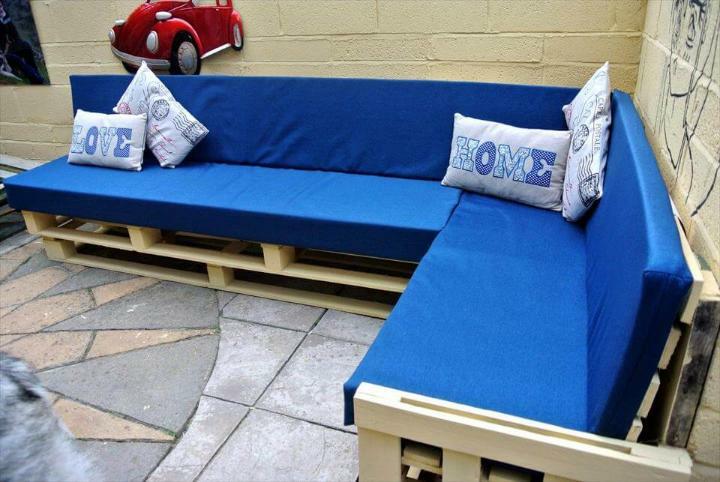 Charming sectional sofa crafted brilliantly with retired pallet skids, having a blue cushion that all replace the annoying wooden angularity with soft and warm feel of comfort! This would be all special platform for formal family gatherings and also for occasional outdoor guest entertainments, also make more benches, single chairs, ottomans and tables with pallets to get a fully fledged sitting set for your patio! Just to make it easily move or for super quick and easy dragging and pushing of it, you raise this entire sofa on heavy duty pure metal wheels that will also bring a distinguished industrial vibe! Highly dense foam mattress have been chosen to get the seats cushioned and it also creates a fascinating avatar of the sofa! A pillow throw would be necessary for small fun fights there!